8:25 AM - We're closed, but we open in 8 hours, 35 minutes. Have a relatively wholesome time with the family every Sunday; all ages are welcome at brunch. The kitchen is open from 10:30am-3pm and last call for drinks is at 3:45. We have live music each week featuring local bands and the occasional touring act. A 20% gratuity will be added to any walkout tabs. 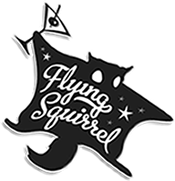 Built & Powered by Fennec Marketing | © Flying Squirrel Bar - 2019.